What's a Good Student to Faculty Ratio for a College? What Is a Match School? What Is a Reach School? In general, the lower the student to faculty ratio, the better. After all, a low ratio should mean that classes are small and faculty members can spend more time working individually with students. That said, the student to faculty ratio doesn't paint the entire picture, and many other factors contribute to the type of undergraduate experience you'll have. Watch out for schools with student to faculty ratios over 20 to 1. Many will not have the resources to provide students much personalized attention. The lower the student to faculty ratio, the better, but the measure will mean different things at different schools. Average class size is a more meaningful measure, and some schools with low student to faculty ratios have many large lecture classes. At research universities, many faculty members spend little time with undergraduates, so the student to faculty ratio can be misleading. What's a Good Student to Faculty Ratio? As you'll see below, this is a nuanced question, and the answer is going to vary based on the unique situation at any given school. That said, it's generally good advice to look for a student to faculty ratio around 17 to 1 or lower. That's not a magic number, but when the ratio starts getting up over 20 to 1, you'll find that it gets challenging for professors to provide the type of personal academic advising, independent study opportunities, and thesis oversight that can be so valuable during your undergraduate years. At the same time, there are colleges with 10 to 1 ratios where first-year classes are large and professors aren't overly accessible. You'll also find schools with 20+ to 1 ratios where the faculty are entirely devoted to working closely with their undergraduate students. Are the Faculty Members Permanent Full-Time Employees? Many colleges and universities rely heavily on adjunct, graduate student, and visiting faculty members in an effort to save money and avoid the type of long-term financial commitment that lies at the heart of the tenure system. This issue has been in the news in recent years after national surveys revealed that over half of all college and university instructors are adjuncts. Why does this matter? Many adjuncts are, after all, excellent instructors. Adjuncts also play an important role in higher education as they fill in for faculty members on leave or help cover classes during temporary enrollment upswings. At many colleges, however, adjuncts aren't short-term employees hired during a time of need. Rather, they are a permanent business model. Columbia College in Missouri, for example, had 72 full-time faculty members and 705 part-time instructors in 2015. While those numbers are extreme, it is not at all uncommon for a school to have numbers like DeSales University with 125 full-time faculty members and 213 part-time instructors. When it comes to the student to faculty ratio, the number of adjunct, part-time, and temporary faculty members matters. The student to faculty ratio is calculated by considering all instructors, whether tenure-track or not. Part-time faculty members, however, rarely have obligations other than teaching class. They do not serve as academic advisors to students. They rarely oversee research projects, internships, senior theses, and other high-impact learning experiences. They also may not be around for long, so students can have a more challenging time building meaningful relationships with part-time instructors. As a result, it can be difficult getting strong letters of recommendation for jobs and graduate school. Finally, adjuncts are generally underpaid, sometimes earning just a couple thousand dollars per class. To make a living wage, adjuncts often have to piece together five or six classes per semester at different institutions. When that overworked, adjuncts can't devote the attention to individual students that ideally they would like to. So a college may have a pleasing 13 to 1 student to faculty ratio, but if 70% of those faculty members are adjunct and part-time instructors, the permanent tenure-line faculty members who are tasked with all advising, committee work, and one-on-one learning experiences will, in fact, be too overburdened to provide the type of close attention you might expect from a low student to faculty ratio. Consider one of the top universities in the world: the Massachusetts Institute of Technology has an extremely impressive 3 to 1 student / faculty ratio. Wow. But before you get excited about all your classes being small seminars with professors who are also your best friends, realize that the student to faculty ratio is something quite different from the average class size. Sure, MIT does have many small seminar classes, especially at the upper-level. The school also does remarkably well providing students with valuable research experiences. During your first year, however, you will most likely be in large lecture classes with several hundred students for subjects such as electromagnetism and differential equations. These classes will frequently break into smaller recitation sections run by graduate students, but chances are you won't be building a close relationship with your professor. When you are researching colleges, try to get information not just about the student to faculty ratio (data that is readily available), but also the average class size (a number that can be more difficult to find). There are colleges with a 20 to 1 student / faculty ratio that have no class bigger than 30 students, and there are colleges with a 3 to 1 student / faculty ratio that have large lecture classes of hundreds of students. Note that there's nothing inherently wrong with large lecture classes—they can be fabulous learning experiences when the lecturer is talented. But if you are looking for an intimate college experience in which you'll get to know your professors well, the student to faculty ratio doesn't tell the whole story. Private institutions such as Duke University (7 to 1 ratio), Caltech (3 to 1 ratio), Stanford University (12 to 1 ratio), Washington University (8 to 1), and all of the Ivy League schools such as Harvard (7 to 1 ratio) and Yale (6 to 1 ratio) have impressively low student to faculty ratios. These universities all have something else in common: they are research-centered institutions that often have more graduate students than undergraduates. You've probably heard the phrase "publish or perish" in relation to colleges. This concept is true at research-centered institutions. The most important factor in the tenure process tends to be a strong record of research and publication, and many faculty members devote far more time to research and the projects of their doctoral students than they do to undergraduate education. Some faculty members, in fact, don't teach undergraduate students at all. So when a university such as Harvard boasts of a 7 to 1 student to faculty ratio, that does not mean that for every seven undergraduates there is a faculty member devoted to undergraduate education. There are, however, many colleges and universities where teaching, not research, is the top priority, and the institutional mission is focused on undergraduates either exclusively or primarily. If you look at a liberal arts college such as Wellesley with a 7 to 1 student / faculty ratio and no graduate students, the faculty members will, in fact, be focused on their advisees and the undergraduates in their classes. Liberal arts colleges tend to take pride in the close working relationships they foster between students and their professors. If a college has a 35 to 1 student to faculty ratio, that's an immediate red flag. That's an unhealthy number that almost guarantees that instructors will not be overly invested in mentoring all of their students closely. More common, especially among selective colleges and universities, is a ratio between 10 to 1 and 20 to 1. To learn what those numbers really mean, seek out answers to some important questions. Is the school's focus primarily on undergraduate education, or does it put a lot of resources into and emphasis on research and graduate programs? What is the average class size? And perhaps the most useful source of information is the students themselves. Visit the campus and ask your campus tour guide about the relationship between students and their professors. Better, yet, do an overnight visit and attend some classes to get a true feel for the undergraduate experience. Do You Know When You Should Turn to the Dean of Students for Help? 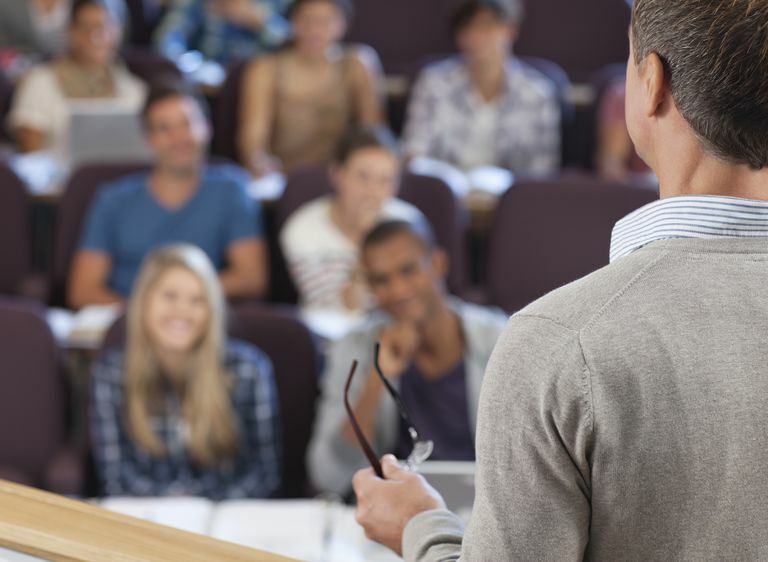 Ever Consider Becoming an Adjunct Professor? The Cream of the Crop: Top Liberal Arts Colleges in the U.S.